Select your best emblem design and make a final version from card by building up layers. This is called a ‘composite drawing’. Include the Olympic colours (remember the Olympic Rings) as this is very important. However, the hosting countries colours are also very important. 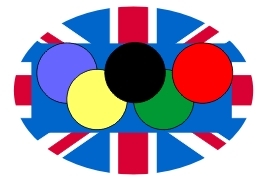 In the example shown opposite, the British Union Jack dominates the background whilst a modernised version of the Olympic Rings has been included. What do you think? The Olympic Rings are cut from blue, black, red, yellow and green card. These colours represent the colours of the five continents. The blue background (representing Scotland) is shaped using scissors. The rings can be glued straight on to this background. Red strips are cut with scissors. These are glued to the white background. This section represents the colours of England and Wales. Finally, all the parts are glued together. If you use good quality card you should see a slight three dimensional affect - to the London Olympic emblem. Using equipment such as scissors and glue and good quality card, make your emblem, as a composite drawing.